In The Simple Art of Vegetarian Cooking, legendary New York Times Recipes for Health columnist Martha Rose Shulman offers a simple and easy method for creating delicious plant-based meals every day, regardless of season or vegetable availability. Accessible and packed with mouthwatering, healthy, fresh dishes, The Simple Art of Vegetarian Cooking accomplishes what no other vegetarian cookbook does: It teaches the reader how to cook basic dishes via templates—master recipes with simple guidelines for creating an essential dish, such as a frittata or an omelet, a stir-fry, a rice bowl, a pasta dish, a soup—and then how to swap in and out key ingredients as desired based on seasonality and freshness. By having these basic templates at their fingertips, readers—wherever they live and shop for food, and whatever the season—will be able to prepare luscious, meatless main dishes simply and easily. They are the ideal solution for busy families, working moms, and everyone who wants to be able to put a wonderful vegetarian dinner on the table every day, angst-free. A true teacher's teacher, Martha Rose Shulman takes the reader by the hand and walks them through 100 mouthwatering dishes including: Minestrone with Spring and Summer Vegetables; Vegetarian Phô with Kohlrabi, Golden Beets, and Beet Greens; Perciatelli with Broccoli Raab and Red Pepper Flakes; Stir-Fried Noodles with Tofu, Okra, and Cherry Tomatoes; Basmati Rice with Roasted Vegetables, Chermoula, and Chickpeas; and much, much more. 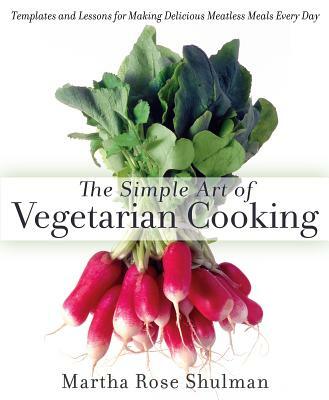 Whether the reader is brand new to vegetarian cooking or a working parent trying to decipher farmers' market offerings or an overflowing CSA box, The Simple Art of Vegetarian Cooking is the perfect tool and the ideal, must-have addition to everyone's kitchen bookshelf. Martha Rose Shulman is a prolific cookbook author with a New York Times column, "Recipes for Health. "Her book Mediterranean Harvest was selected by Cooking Lightmagazine as one of the top vegetarian cookbooks of the past 25 years.